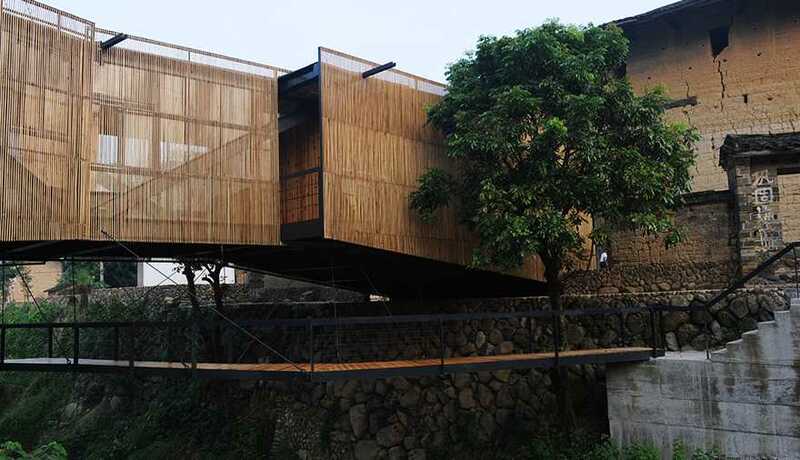 The site is located in Xiashi, a traditional Hakka village in Pinghe County, Fujian Province. There are two round Tulous (earth buildings) separated by a creek at the center of the village. According to legend, the families of the two Tulous were enemies in earlier times. The creek was the boundary between them, demarcating their lack of interaction. The yellowish brown color of the Bridge School ties the Tulous together at the same time that the sharpness of the suspended bridge building is a stark contrast to their roundness. Tulou are a unique congregate housing form, reflecting clan culture and the introverted, defensive and turbulent past of Hakka settlements. Today the traditional culture gives a tranquil charm and rich cultural heritage to the village. But, under the influence of the cultural patterns, village households remain separate with little but muddy land between them. The village lacks public spaces for in which to gather, communicate or cohere. Indigenous culture, environments and situations are typical concerns of Li Xiaodong’s. They have also often been the focus of his designs. In this village, the architect identified the lack of interpersonal communication between villagers with the lack of public space. He saw that residents on both sides of the creek had little interaction due to the inconveniences of making contact, and that local development was slow or even stagnant due to the scarcity of resources and the remote location of the village. The idea that “a Hope Primary School might be the opportunity to optimize this primitive spatial system” arose spontaneously. A “bridge,” traversing the creek and connecting the two Tulous, was inspiration that Li Xiaodong got from the area. Combining the primary school with the bridge becomes the main concept of the design, a move that could link the “broken” Tulous and simultaneously activate a space at the center of the village. The Bridge School could connect the past, present, and future. Xiashi’s Hope Primary School has only two classes and is simple in terms of the facilities it provides: two lecture theatres and one small library. The architect placed these three functional blocks all on the bridge. A corridor on one side of the classrooms leads to the library in the middle, and the two classrooms—at either end of the bridge—face the two Tulous. The end of each classroom is equipped with sliding and folding doors that, when open, can transform the ends of the building into a stage to serve the residents when classes aren’t in session. In the class, the same wall is used as a blackboard and platform. After school hours, public activities such as puppet shows can be performed there. The Bridge School creates a functional and formal connection between the two Tulous. It also links and reorganizes the surrounding open spaces to provide a public square for the village. On one side of the square is the round and rough Tulou, while on the other side is the delicate stage. The strong contrast between them fills the entire space with tension. When night falls, villagers spontaneously gather for public activities. The provides classrooms for children, solves a fundamental circulation problem for the village and creates a communication center for the village. 28 meters long and 8.5 meters wide, the whole building is a steel truss structure with the interior space of the truss used as classrooms. There is a public space between the two classrooms and outside the classrooms is an aisle that acts as a visual corridor between the classrooms and the building’s skin. The outer surface of the building is clad with wood screens. This tulle-like skin keeps the view of pedestrians directly outside the spaces from disturbing class activities but allows the waterscape further away to be viewed clearly. Underneath the building is a public Z-shaped bridge suspended by steel wires. To avoid a conflict with the squares ends of the building, the architects deliberately altered the direction of the bridge as it approaches the square. Without a “showy” volume or pompous details, but by creating poetic space using the language of modern construction, the building sits in appropriate contrast to the village and catalyzes a string of positive possibilities. Contemporary architecture in a traditional context seems to fall into one of two camps. One exaggerates and indulges in modern technical expression. The other is nostalgic for preindustrial times. In the design of the Bridge School, the architects tried to find a way between the two extremes by using a humble (in its straightforwardness) modern technical language. Started in September 2008 and completed in August 2009, the Bridge School has played a positive and active role in protecting Tulou culture and enriching the cultural life of local residents. In keeping with the architect’s initial design concept it has produced the minimum disturbance in the environment, had the greatest positive impact and brought new energy to the ancient Tulou. The project of Bridge School—its design, location selection and focus—goes beyond the issues of a primary school to attend to the overall spatial problems of the village. Li Xiaodong maintains that architectural design should be similar to the practice of traditional Chinese medicine, which aims to coordinate the bodies systems to treat the patient instead of only focusing on the disease. Comparing the Bridge School with a previous work—the Yuhu Elementary School in Lijiang—it is easy to see a completely different focus in the two buildings. They are completely different yet they both attach importance to the issues of environmental systems. In this new era of rural development and with the impending flood of construction in the countryside, it is critical to not only pay attention to building buildings but also focus on improving the spatial qualities of rural communities and upgrading the lifestyles of rural residents. One can only hope that the Bridge School—and all the fine thinking behind it—is recognized as the inspiration it is, a guide to fully intelligent design.